The 125th Boeing Delta 2 rocket blasted off from Cape Canaveral Friday afternoon on another mission to replenish the satellite constellation of the Global Positioning System. The three-stage booster departed pad 17A at 2:12 p.m. EST (1912 GMT) after a one-day weather delay. Mother Nature smiled for the second launch attempt, giving crystal clear skies that allowed the booster's smokey contrail to be seen from a couple hundred miles away. The 68-minute ascent delivered the 4,500-pound GPS 2R-16 spacecraft into a temporary egg-shaped orbit stretching 11,000 miles from Earth at the highest point and just 100 miles at the closest point. It marked the 70th consecutive successful flight by a Delta 2 rocket since 1997 and the 123rd success overall in the 125-flight history of the workhorse booster dating back to 1989. "Our Delta team understands the importance GPS satellites play in protecting our military and helping them defend our country," said Dan Collins, vice president and general manager of Boeing Launch Systems. "The Delta 2 vehicle has a strong record of performance, and I am proud of the team's commitment to mission success and our role in sustaining the GPS constellation." In the coming days, the spacecraft will use an onboard motor to circularize its orbit and increase the distance it travels north and south of the equator. Controllers will maneuver the $75 million craft into the Plane B, Slot 4 position of the GPS constellation to replace the ailing GPS 2A-22 satellite, which was launched in August 1993 with a seven-year design life. "That particular satellite has been exhibiting some problems lately. That being a primary slot in the constellation, we're anxious to go ahead and get this (replacement satellite) up there and make sure we have the primary slot covered," said Col. Allan Ballenger, commander of the Air Force's Global Positioning Systems Wing. The orbiting network currently has 29 satellites that are relied upon by U.S. military forces to guide aircraft, ships, troops and precision bombs. GPS 2R-16 is the third in a new breed of updated craft built by Lockheed Martin. The modernized satellites transmit additional signals and feature improvements aimed at greater accuracy, tougher resistance to interference and enhanced performance for users around the world. "This new modernized satellite provides unique new capabilities for civil users as well as for military users," Ballenger said. GPS 2R-16 is expected to enter service by mid-December. "The modernized 2R-M program is providing new capabilities for navigation users around the globe and we look forward to executing a timely and efficient on-orbit checkout of this world-class, high-performance spacecraft," said Don DeGryse, Lockheed Martin's vice president of Navigation Systems. The military says GPS is critical to the warfighters in Iraq, not only for hitting targets but also minimizing collateral damage. "It's being used each and every day in many, many different applications. But primarily GPS is an enabler of precision warfare. That's its critical military capability and that has a number of benefits to the military," Ballenger said. "It allows us to put weapons on target very precisely. Now that's good from a military-sense; we have high confidence then that we can take out a military target at any place and time of our choosing in any kind of weather conditions. That's critical to military operations. But more importantly, GPS is helping save lives because by being able to place a weapon more precisely we can use less firepower." The Air Force has launched three new GPS satellites in the past 14 months to keep the orbiting system in good working condition. The next is tentatively slated to fly in September 2007. There are five GPS Block 2R craft left to deploy in this current series. "As we look at the constellation and look at each and every satellite to see how long we anticipate it surviving based on all of the redundant clocks or other subsystems, that drives our need to replenish the constellation," Ballenger said. This year has been a busy one for Boeing's Delta program. Friday's launch was the eighth for the combined Delta 2 and Delta 4 rocket fleets from both Florida and Vandenberg Air Force Base, California. 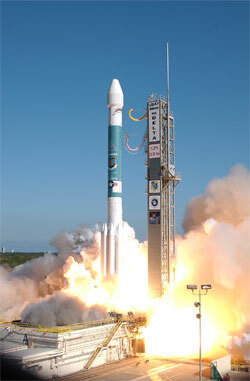 Delta 2 has flown five times; the Delta 4 three times. 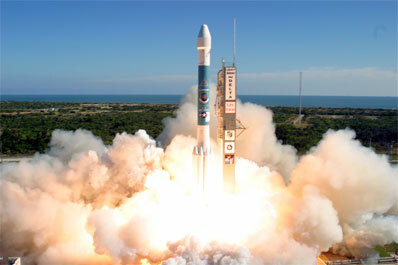 The final launch of 2006 is expected in less than a month when a classified National Reconnaissance Office payload is lifted to orbit from Vandenberg aboard a Delta 2. Launch had been planned for December 7, but that pre-flight schedule has been impacted by weather. "Just recently we've had some bad weather out there at Vandenberg that has delayed operations for a few days. I wouldn't have a launch date to give you on that one yet, but we are going to get as close as possible to December 7," said Col. Jim Planeaux, director of the Air Force's Delta Launch Systems Group based at Los Angeles Air Force Base. Next year begins with a Delta 2 lofting five tiny satellites for NASA's THEMIS mission to probe Earth's magnetosphere. Liftoff from the Cape is set for February 15. The first operational Delta 4-Heavy rocket will be rolled to the Cape's pad 37B next month to begin preparations for liftoff in mid-March carrying the Air Force's final Defense Support Program missile warning satellite.